The 2011 Chickasaw National Recreation Area Quarter 100-Coin Bag will contain 100 circulation quality strikes of the tenth coin to appear as part of the US Mint’s America the Beautiful Quarters™ Program. Each strike in the bag will contain a reverse design emblematic of Chickasaw National Recreation Area, which is located in Oklahoma. It is but one of fifty-six quarters to be issued by the Mint as part of the America the Beautiful Quarters Program which debuted in 2010 and runs until 2021 at a rate of five per year. Quarters included in the bag will either be struck at the US Mint’s facility in Philadelphia or the US Mint’s facility in Denver – buyer’s choice. The US Mint typically releases strikes of the America the Beautiful Quarters in several different product options including these 100-coin bags as well as two-roll sets, proof sets, mint uncirculated sets, etc. 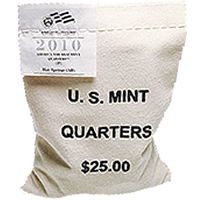 Each 100-coin bag is typically imprinted with "U.S. MINT QUARTERS $25.00". A label is sewn into the closing stitches of the bag showing the specific contents of Chickasaw National Recreation Area Quarters and the mint of origin – Denver or Philadelphia. The US Mint has set November 14, 2011 as the release date of the Chickasaw 100-Coin Bags. The US Mint has been selling the previous releases for $49.95. George Washington, the first President of the United States, will be featured on the obverse (heads side) of all of the America the Beautiful Quarters. It is based on the original work of John Flanagan. Donna Weaver designed the reverse to show the Lincoln Bridge found within the recreation area’s boundaries. It was sculpted by Jim Licaretz.